It's Halloween and although I didn't dress up this year, I still love the excitement of the night. I love jack-o-lanterns, roasted pumpkin seeds, and the sight of little witches, superheroes, and ghosts running up and down driveways to grab as much candy as they can, as quickly as they can before their parents tell them it's time to go home. This Halloween, I dutifully bought a bag of candy and waited for our trick-or-treaters, but what I really wish I could have given them was a bag of homemade treats. Unfortunately, even I grew up knowing you didn't eat Halloween candy that wasn't hermetically sealed by the manufacturer. If you do feel comfortable giving homemade treats to your neighbors, then I would recommend this easy and delicious chocolate bark. It can be changed to fit whatever your fancy - even yellow candy corn would make a welcome addition to this chocolate treat. Oh, and don't just wait until next Halloween to try this out - I'm sure you can come up with a few excellent holiday variations on the theme as well! Prepare an 8 x 8 inch pan by laying parchment paper in it, making sure the paper drapes over the side so the bark is easy to pull out of the pan when cool. Spray with vegetable oil and set aside. Melt the chocolate in a double boiler and pour into the pan. Sprinkle the other ingredients over the chocolate and let set in the refrigerator for at least 30 minutes. Remove, break apart, and enjoy! Well, it's finally here, folks! Almost 2 years after you all helped to get me into the world's first crowd-sourced cookbook, The Food52 Cookbook: 140 Winning Recipes from Exceptional Home Cooks is now on the shelves. It's an exciting time and I can't wait to get my copy (which should be arriving in the mail any day now). Food52 struck a chord with me when I first heard about it. It was the first of its kind - a combination of a recipe amalgamator and a food driven, web-based community. It praised home cooks, both the ambitious and the realistic, and together we began to give a voice to all of those cooks out there who put delicious meals on the table every night. Food52 is still doing this (only this time on a fancy updated website) and will continue to do so as long as there are home cooks out there who want to be involved. I for one now go there whenever I need a little inspiration, or help with a food question, or even just to look at pretty pictures of food - there are TONS of those - and I will continue to do so as I grow as a cook and entertainer. This weekend, I'm hosting a launch party for the cookbook in our little Chapel Hill house. We'll be celebrating with friends, a potluck of Food52 recipes, and, in true Food52 fashion, lots of giveaways. But tonight, on the day of the launch of this exciting venture, I wanted to remember how it all started. So Sam and I dined on Linguine with Breadcrumbs and Kale, my Food52 winning dish. It's still as simple as ever, and I still marvel that I made it into the cookbook with it (thank YOU! ), but it is honestly one of the most wonderfully satisfying and tasty dishes I have ever made. So I leave you with an oldie but a goodie, and I challenge each of you to go ahead and make up your own cookbook worthy recipe in the kitchen tonight. You might be surprised by what you come up with! Boil pasta in salted pot of water. Process bread in a food processor until it’s about the consistency of coarse cornmeal. Heat oil in a frying pan and add the garlic. Once the garlic is just fragrant, add the breadcrumbs, salt & pepper, and cook until the breadcrumbs are slightly toasted and golden brown. Remove the garlic and breadcrumbs and let sit. Add more olive oil and the kale to the pan with a little bit of the pasta water and sauté quickly. Add the drained pasta to the kale, and add back in the breadcrumbs. Add the rest of the oil as needed and mix in parmesan, more salt & pepper to taste, and serve. It's my favorite night of the week - Meatless Monday! I think I like it so much because it forces me to be a bit more creative in the kitchen. After living with Sam, I've pretty much mastered the protein/veggie/starch dinner combination. Nothing fancy, but consistently tasty and always satisfying. This year though, we're committed to eating less meat, for our health and for our planet. We try to buy only humanely raised beef, pork, and chicken, but it never hurts to leave it out completely a couple of times a week. Meatless Monday is not a new concept, but I encourage you all to try it out if it's not already a standard in your household. It doesn't have to be Monday, but knowing that you'll be eating like a vegetarian on the same day every week will help you stick to it. This meal is simple because it's centered around my favorite method of cooking vegetables - roasting. By now you've realized that I roast every vegetable I can get my hands on. It's a great way to muti-task on those evenings when you have things to do at home and need a little time before dinner to get everything done. This recipe can be altered to include any roasted vegetable you have on hand, including veggies that may have been roasted for the previous night's dinner. I loved the combination of roasted tomatoes and cauliflower, and the sungolds happened to look amazing at the market last week, but I can imagine using kale, brussels sprouts, peppers, or even carrots. Just remember that Farro (which can be found in most specialty food stores) has a nutty, rustic flavor that craves the balance of something a bit acidic. Top it off with a bit of parmesan and you have a delicious meatless meal. Heat the oven to 400 degrees. Spread the tomatoes and cauliflower on a baking sheet large enough to hold them in a single layer. Coat with the olive oil and season with salt & pepper. While you're making the Farro, roast the vegetables until the tomatoes begin to wrinkle and the cauliflower begins to brown, about 35 minutes. Remove the veggies from the oven. Once the Farro is ready, pour into a large bowl. Pour the vegetables and their juices over the Farro and toss to combine until the Farro is coated. Add the parsley and parmesan and toss to combine. 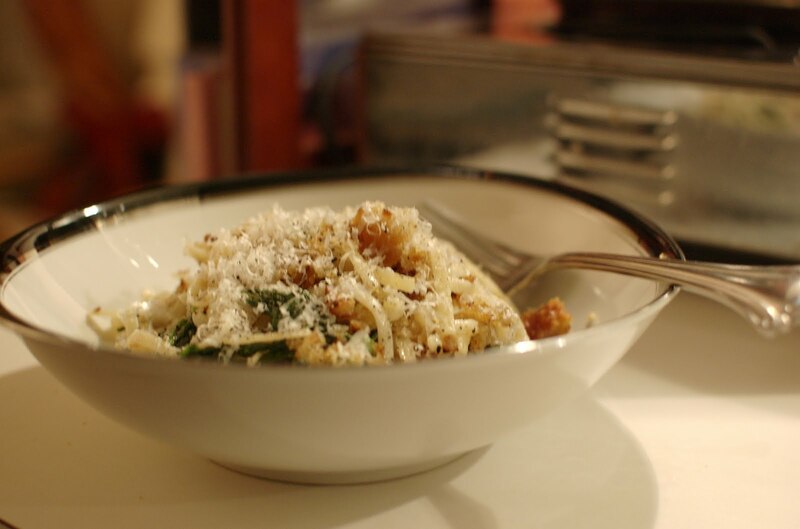 Season with more salt & pepper to taste, and serve with additional grated parmesan. 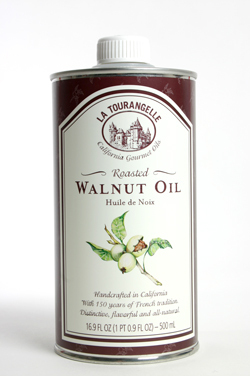 Walnut Oil: It's More Than Just a Fancy Bottle! Last week, I made one of my favorite easy weeknight meals: roast chicken. You've seen my lazy (wo)man's recipe here and it's still the one I turn to every time I get the hankering for a juicy and flavorful chicken and also have an hour and a half to spare. It takes absolutely no effort and the result is dinner for two for 2 or 3 nights - not bad for an hour and a half of roasting time! This time, I decided to experiment with a few nut oils I have in my cabinets - peanut and walnut. Now, peanut oil is a staple if you're like me and love to make stir-fries at least once every two weeks, but walnut oil is a little more of an investment. Yes, it's close to $9 at most grocery stores, and no, it's not used for that much, but when you do use it, you will be oh-so-pleasantly surprised. I happened to get my bottle of fancy walnut oil for a specific dish, and then promptly forgot to use it in said dish. Twice. Sam was a little annoyed so I was determined to start using the oil ASAP. My mom found a delicious asian inspired chicken salad that includes both oils and a raspberry vinegar. It's refreshing and satisfying and I wanted to try it with our leftover chicken but didn't want to go out and by another bottle of vinegar (remember Sam's annoyance at the walnut oil...) so just substituted red wine vinegar. I couldn't find the recipe, so just went on taste, and I was pretty pleased with the results. No one complained, and there were only clean plates at the end of dinner. Combine the chicken, walnuts, basil and salt and pepper in a bowl. In another bowl, pour the red wine vinegar and then slowly pour in the oils, one at a time, whisking constantly. Add salt and pepper to taste, and additional oil to taste. Pour 1/4 of the vinaigrette over the greens and toss until coated. Pour the rest over the chicken mixture and mix until completely coated as well. Add greens to each plate and serve the chicken over the greens. Top with scallions and more salt and pepper if desired. This is the walnut oil I used. I'm officially in the mood for fall. This weekend was gorgeous and Sam and I took full advantage of it. We went to a pumpkin patch and picked some pumpkins, we broke out the slow cooker, we watched some football, and we threw on the wool sweaters. All in all, it was the perfect autumn weekend. The only way to make it better? Make pumpkin bread! It was a busy weekend so we didn't get to it until about 9 on Sunday night. Luckily, Sam is always up for an evening baking fest (since the outcome means he gets delicious pumpkin bread for the week). My recipe comes from my godfather who uses honey to give the bread a richer sweetness that pairs well with the pumpkin. And to push it over the edge, Sam and I like to doctor it with our favorite baking addition: Chocolate chips. This recipe is easily halved, which is what I would do when we were in our tiny NYC apartment so that I could fit it in our toaster oven. This time however, with a full-sized oven at my disposal, I decided to use the whole recipe and bake the bread in a bundt pan. It came out beautifully and the best part? Every slice gets a whole lot of that lovely crust of which I always wish there was more. Preheat the oven to 350. Grease and flour the bundt pan generously. In a large bowl, sift the dry ingredients. In the bowl of a stand mixer, beat the eggs. Add the butter, water, pumpkin and honey and mix until combined. Gradually add the dry ingredients to the wet and beat until combined. Fold in the chocolate chips and walnuts. Pour into the bundt pan. Bake for 1 hour and 15 minutes or until a cake tester comes out clean. Here in Chapel Hill it has been HOT. Hot and muggy and not that pleasant. Until yesterday. It was gorgeous! Still warm, but the humidity was almost gone and I swear it felt like Spring. If there weren't leaves starting to fall, I would have thought we skipped a few seasons. But I guess that's just what life is like here in sunny CH. Tough, huh? That said, this recipe has really nothing to do with the weather, (and today it definitely feels like fall!) I just had a hankering for it. I found my go-to carrot soup recipe one Easter when I decided I wanted to cook dinner for my family. The only problem? I was living in my tiny West Village apartment of hotplate fame. I needed something that could be made ahead and didn't require too many ingredients (since I was already making an herb crusted leg of lamb in my toaster oven and there wasn't room for much in my mini fridge!). Carrot soup fit the bill and was a festive addition to my Easter table. Now I turn to it often. It may not seem like it, but it's an incredibly satisfying dish (even Sam only needs one big serving usually!) It's also a great, way to use up carrots if you found yourself buying a 5 lb. bag because it was on sale. This time, I turned to the Food52 community for some additional inspiration and I'm so glad I did. The recipe I found called for roasting the carrots instead of just boiling them in the stock. I took the recipe one step further and decided to roast the onions as well. What resulted was a creamy (it almost tasted like I put heavy cream in it! ), fragrant soup with a lot more depth than I would have thought. Both of my carrot soup recipes called for ginger which I decided to keep here because it brings a subtle heat to what might otherwise be a bland soup. I still like the boiled carrot version (and it's a quicker recipe if you're pressed for time) but in the fall, I recommend trying the roasted version. Serve it as an appetizer or with a grilled gruyere cheese sandwich or even just a delicious baked potato (bonus, you can bake it at the same time as the vegetables!). One of the best appliances I ever purchased! Preheat the oven to 375. In a baking dish, spread out the carrots and onion and drizzle with olive oil and salt and pepper until lightly coated. Roast the vegetables for 35 minutes until browned and softened. Heat the oil in a large soup pot over medium heat. Add the garlic and ginger and sauté until just fragrant. Add the carrots and onions, broth, and additional salt and pepper. Bring to a boil. Reduce heat and simmer for an additional 10 minutes. Turn off the heat and using an immersion blender, puree the soup until smooth. Reheat the soup and serve.